This mod will make sims wear their everyday outfit for Tai Chi. Comes in two versions: if you have FT, AL or M&G, download "Everyday Tai Chi - FT-M&G". If you don't have any of those EPs - i.e. your latest EP is BV - download "Everyday Tai Chi - BV only". This mod may conflict with anything that modifies the Tai Chi interaction, but I'm not aware of anything that does. Compatible with "no autonomous Tai Chi" mods. ihatemandatoryregister for their apparent grudge against sportswear. 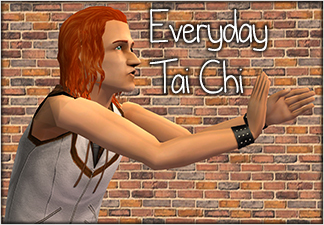 Everyday Tai Chi - FT-M&G.7z | Description: Download this if you have FT, AL or M&amp;G.
Everyday Tai Chi - BV only.7z | Description: Download this if you don&#039;t have FT, AL or M&amp;G.